There came a time when I started to understand more of the elements of Hellenic ritual, and desired to include more of them. First came Hestia. 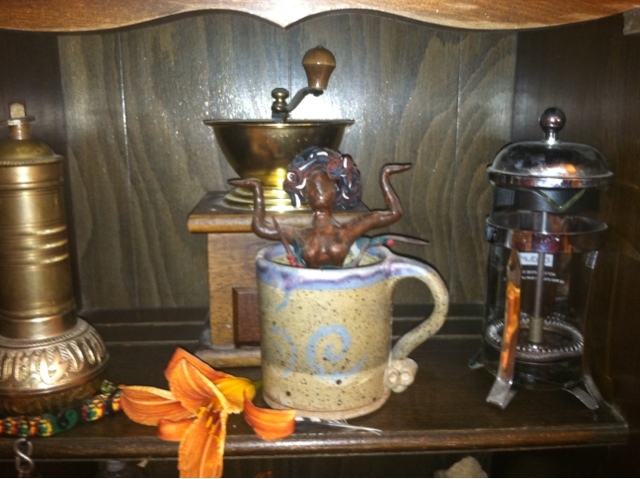 Cult statue of the goddess Caffeina. I learned about how Hestia is, in many Hellenic homes, honored first and last, and how there seemed to be no small number who poured a libation of coffee to her in the morning. I considered the Caffeina shrine that we already had in our home, overseeing our waking lives. Caffeina, who had been the goddess at our handfasting. Caffeina, over whom my wife and I had bonded. I realized that — for me, at least — the syncretized Hestia Caffeina was definitely a goddess. The fact that our existing Caffeina shrine backed up against the far side of the fireplace didn’t hurt, either. Two things I did not anticipate came from that syncretization. First, Caffeina started getting paid her due much more often; until then, it was left to seasonal celebrations. Second, since I drink coffee every day, it made sense to pour a libation just as regularly; thus I shifted to a daily practice without really even noticing. Apparently that wasn’t quite enough, because somewhere along the way I put a candle for Hestia on the mantle over the hearth, which some might find redundant. I might agree on those mornings when I light it over a blazing fire, and particularly that time we played “Fireplace in Your Home” on the television next to the blazing fireplace beneath the burning Hestia candle, but none of that was to happen until more recently. By bringing Caffeina and Hestia together in my practice, I gave it a bit of a kick-start that led it to grow, by and by. Barley. Khernips. Lots more incense. Eventually, I even started buying wine. I doubt I could have set out to begin a daily practice on purpose, but inside of my existing habits that happened of its own accord. Gods work in mysterious ways and, for me, that meant helping me find the energy and momentum to give them more. Very clever, them. Start with milk and sugar. My dearly departed father often said that he never enjoyed coffee until he stopped using those ingredients, but few of use are able to start without them. There is a balance in the world, and in your body. Every period of energy must be followed by one of rest. Do not ignore your body’s needs. Caffeina is a goddess who evokes much humor, but if you’re serious about her worship, take her seriously. At the same time, I hope never to see a time when someone gets offended by Caffeina jokes. Be excellent to each other. Caffeina is a goddess of community. That’s “unverified personal gnosis” for all of you folks who loathe initialisms and other lazy abbreviations as much as I do. I only use it for Google’s sake. I’ve already touched on the most significant revelation that I’ve had about Caffeina, that it’s perfectly acceptable to worship her as Hestia Caffeina in keeping with Hellenic practice. This really speaks to the question of what kind of polytheist I am, because I am saying that Caffeina is an epithet, or title, of the goddess Hestia. This syncretic practice describes one as an aspect of the other, which makes a lot of sense if you consider that Hestia is the first to be honored each day, a place which Caffeina understandably holds for her devotees. However, does this mean that I no longer acknowledge Caffeina as a unique, individual being? Not at all. Both she and Hestia are individuals in my mind. Those offerings I make to Hestia, other than a libation of coffee, are not to Hestia Caffeina. Likewise, when my wife (who does not follow a Hellenic path) and I worship together, it is to Caffeina we pray, not Hestia Caffeina. Simply put, I don’t think that my limited concept of the nature of deity is at all qualified to define individuality. They are separate, and they are not. It’s paradoxical, and I’m okay with that. I consider myself a polytheist, and not one of those polytheists who believe that all of the gods are facets of the same unknowable whole, either. The ideas of “one” and “many” are entirely human, and I am content with the seeming madness of suggesting that both are likely true. When was she first worshiped by this name, and by whom? That she’s a false goddess. The biggest change in my worship of Caffeina is that I now do so in a Hellenic manner, pouring libations to her on a regular basis, when previously my practice was less frequently overt. Not to say that there wasn’t a robust relationship there already: I occasionally performed hymns publicly for her, and she was the goddess invoked in our handfasting, so it wasn’t just fond thoughts and warm fuzzies between us. But those times were generally planned well in advance and required some orchestration, so it could be a year or two between. On the other hand, Caffeina has been a central figure on the family altar for many years, so while the outward acts were not frequent, the inward devotion was not entirely absent, either. Neopagan beliefs in a broad sense support that sort of internalized worship, and it served me well for many years. Because she has walked with me through my shift from an individualized practice to one that is modeled on [what little we know of] ancient Hellenic ritual, I feel like she’s a good touchstone for me. The fact that I found a reasonably Hellenic way to honor her was one of the first ways that I confirmed that embracing Hellenismos was a good choice for me. She strikes me as the kind of goddess who can adapt to many lifestyles and traditions. Consider this my official call to teach me something I don’t know about her. It shouldn’t be too difficult, because I don’t know much. Caffeina is a goddess of the waking world, and she certainly does help manipulate our time in that realm, but slumber is also part of that balance. Some nights — afternoons, even — I’ll take a sip of coffee and my very spirit will recoil from it. Given that physical symptoms such as heartburn and spiritual ones like troubled dreams often follow, I am learning to respect that “no” is a valid answer.